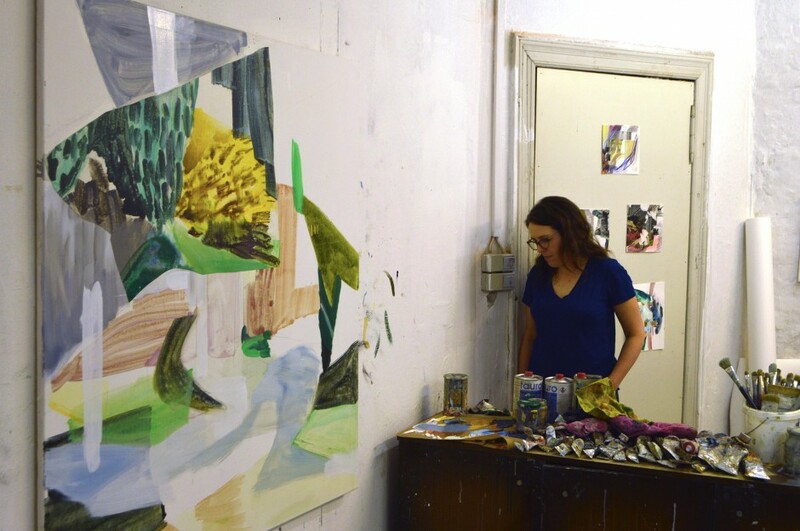 Julie Beugin is a Berlin-based painter. Beugin’s past works were plays on interior/exterior architectural spaces inspired by literature. 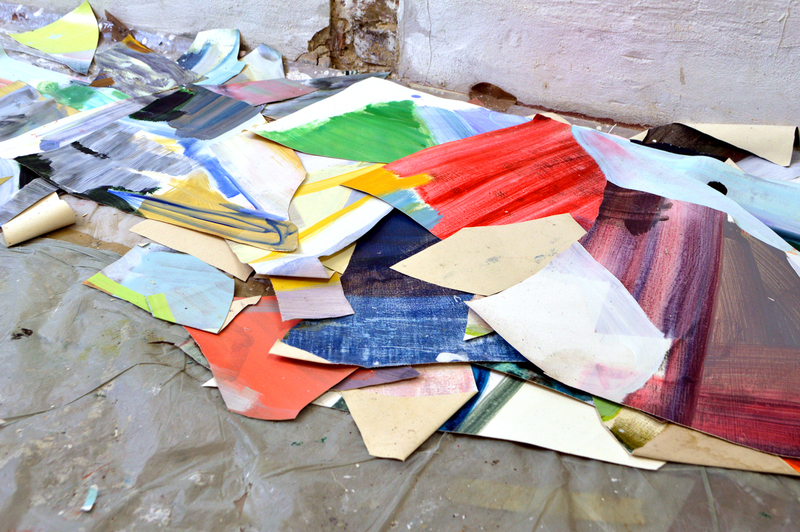 Her new series moves into layered abstraction, often featuring collage elements gleaned from her own recycled paintings. These light filled and lusciously coloured canvases move in and out of space, capturing the viewer in their depth. 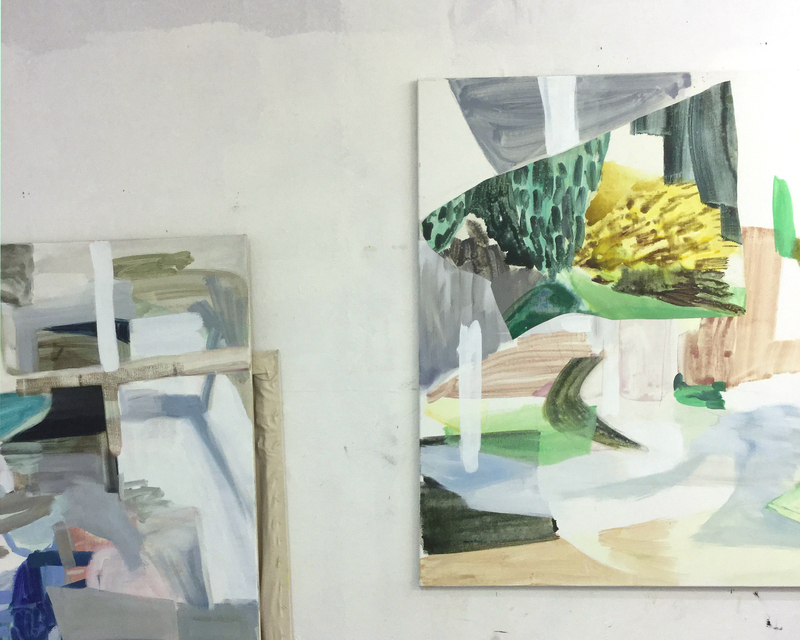 Beugin’s latest works will be featured in a group show in Berlin in March 2016, ‘After the Fire’ at Horse and Pony Fine Arts, as well as a solo-exhibition, ‘Detours’ at Paul Petro Contemporary in Toronto, opening April 29, 2016. I used to work with literary references but I haven’t for a long time. I think for a while I thought I needed an intellectual reason to paint. Its been a slow transition to find a different way to create paintings. When I moved to Berlin I shifted away from interior space. My experience in Canada was a lot of domestic space. People really focused on interiors because of the weather. A lot of people live in single family homes in their own private world. When I moved to Berlin, apartment living is common. People live in the city more- more outside. Coming to Berlin I got really into urban space and walking around the city. Seeing all the different architecture and seeing the shifts in historical periods all smashed together is a big inspiration. I start with a collage of my photographs of the city- of Berlin and other cities I visit – and that becomes the skeletal structure to kind of build the bones of the composition and pick initial colour. Then, as I progress through the painting I will collage on a section of canvas from a previous painting and that allows me to completely shift my plan. So my original plan goes out the window and I’m suddenly dealing with just unknown variables. I don’t want the final painting to be about a specific city, or country, or space, but to be its own discovery. I like the feeling that as I’m making it I’m on this journey and I’m discovering a new thing that I couldn’t have imagined beforehand. I often photograph mundane and generic spaces in a city. Things that aren’t too spectacular or definitely I avoid any tourist destinations or anything recognizable as a specific city. I’ll take close ups of bits of: urban landscape, or cultivated lawns, or shaped hedges, or geometric concrete things. Light is also often something I’m drawn to – I look for cast shadows. There’s something about picking out a detail that is generally unnoticed. The inventiveness of certain urban geometry really appeals to me. I’m drawn to post-war modernism and the geometry of brutalist architecture but I wouldn’t say that that is what my work is about. There’s a lot of that in Berlin because a lot was rebuilt after the war and built quickly. A lot of people see this as hideous architecture but I see a lot of inventiveness. But, a lot of that influence disappears in the final painting. I don’t really talk about that in artist statements because it is more the inventiveness than the architecture that I’m interested in. You do get a sense of geometry but since my photos are usually really close up its quite ambiguous what the source is. There’s something about creating a kind of intimacy out of all of this mundane, anonymity of urban space – how it can just feel just overwhelming and empty. Somehow my paintings are quite intimate I think it’s because of the close ups of spaces, which become these crowded networks of space. These attributes of the painting often give you a sense of enclosure. 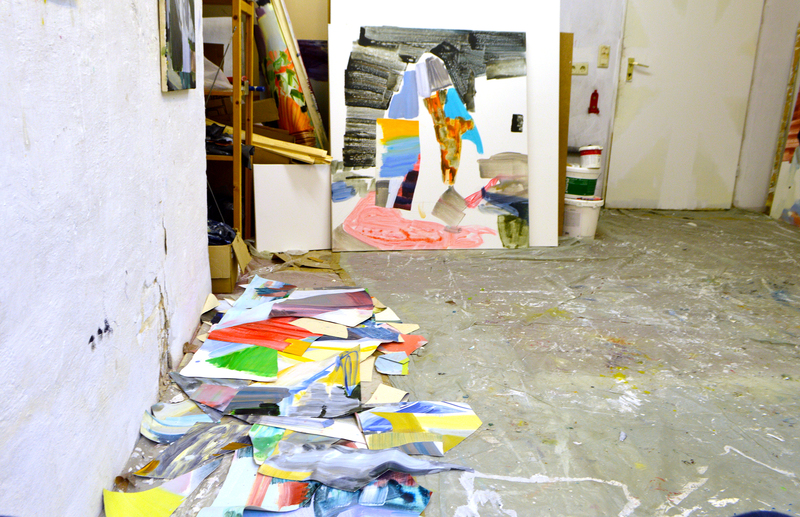 The collage process in my painting came out of a period of being very frustrated in the studio. I knew I wanted to become more abstract and for the spaces to become less defined and more ambiguous but it was a hard transition. I had all these paintings around the studio that were just terrible but they had these good sections. So I had this moment of chopping them all up and trying to salvage the good parts. 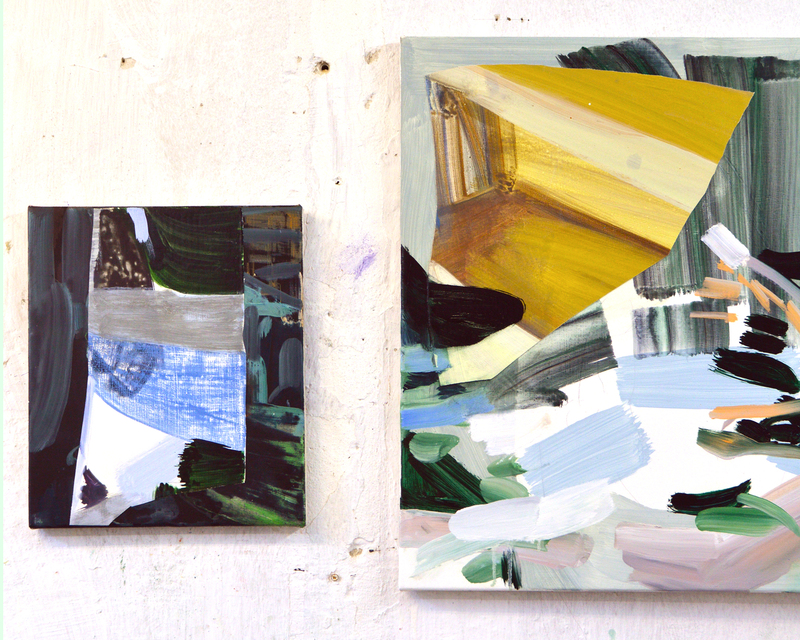 Chopping them up was a great learning tool- it made me isolate sections of paintings and decide why they were good. There might be a section of the painting that I think is amazing and genius but its awkwardly placed. I’ll have to cover over it or destroy it. Being precious about any one section is not helpful for me. I have to continue with this sense of casualness throughout. Nothing is too precious and I can cut up anything. It could all disappear at any moment. And if I can continue with this slight detachment its better for me. I often think the paintings I love the most might end up being the worst paintings. The collage element lets me have some sort of investment of time in the painting but still maintaining an ephemerality. I could work on a painting for a year and have it not work out and then cut it up. By salvaging that section I get to keep that year-long investment of time in my work.